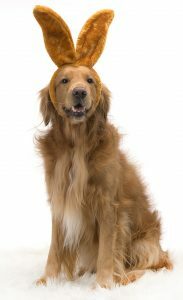 Join the Easter Bunny on April 27th, 2019 with your canine friend(s) for our AFTER Easter Egg Hunt! That’s right, the Easter Bunny decided he would bring all the left over eggs to DVGRR for the doggies on April 27th! Gate opens at 11:00 am and the Egg Hunt will begin promptly at 11:30 am. A suggested donation of $5.00 per dog will be collected at the event. After the Egg Hunt, join the Easter bunny for more games and FUN! Raffles, food and games! Tell your friends, all dog friendly and human friendly canines are invited with their owners. Pets must remain on leash 6′ or under, no flexis. RSVP to inza@dvgrr.org before April 11th, reservation not required but it does help us plan for the event. This event will be held rain or shine! Help the DVGRR Dogs! Sponsor an Easter Egg Hunt Prize Basket $25.00. Click here now! Your sponsorship information will be listed on our website and on a banner at the event on April 27th!